The AIR MILES Reward Program is an easy way to collect points to redeem for travel, leisure, entertainment and a wide variety of valuable merchandise. AIR MILES reward miles can be collected from all types of companies across Canada, and there are lots of rewards to choose from. They have a list of over 100 sponsors and hundreds of rewards. 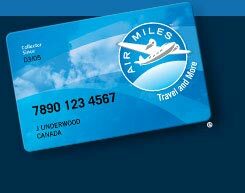 Present your AIR MILES Collector Card when you make a purchase from a qualifying sponsor. Earn 1 reward mile for every dollar spent. Build up your AIR MILES reward miles and then exchange them for rewards ranging from flights, hotels, merchandise certificates and even toys. Starting in January 2012, Air Miles have an expiry date. Also, all previously issued miles will expire if not used.. These are just a few of the sponsors involved in the Air Miles program. It gives you an idea of the various retailers and service providers who honour the Air Miles program. It can be faster than you think to collect points to receive a reward. The Loyalty Group started the AIR MILES Reward Program in March 1992, giving Canadians the chance to collect AIR MILES reward miles while shopping for goods and services at participating sponsors. Air Miles is currently owned by Loyalty One, whose parent company is AllianceData. These reward miles can be exchanged for air travel on nine airlines: Air Canada, WestJet, CanJet, Canadian North, Calm Air, American Airlines, Lufthansa, Northwest Airlines and KLM Royal Dutch Airlines. AIR MILES reward miles can also be redeemed for more than 800 reward options, including tickets to sporting events, car rentals, movie passes, live theatre tickets, family attractions, hotel accommodations and merchandise. The AIR MILES for Business Program is a database coalition marketing program assisting companies to meet their business objectives. Participation in the Air Miles reward program has reached more than 70% of Canadian households. Approximately 2/3 Canadians have an AIR MILES collector card and there are 10,000,000 active accounts. There are more than 100 sponsors across Canada. There are more than 450,000 business owners enrolled in the AIR MILES reward program. There are more than 100 AIR MILES Business Partners.. There are more than 1200 items in the merchandise catalogue. All you have to do is browse online and start collecting. Many of the items are available only on the www.airmiles.ca website. They also have "sales" called Web specials so it is worth checking the website every once in awhile! There is even a Flight calculator to determine how many reward miles you'll need to get where you want to go or a Travel calculator to see how many reward miles it will take to get you where you want to be. All of the Air Miles sponsors can be found on the Sponsor page at www.airmiles.ca. A powerful search function allows you to find the sponsors by name, category or even by neighbourhood. There is a Sponsor finder map so that you can zoom in on your neighbourhood to see where you can go to collect your Air Miles. The Offers section at www.airmiles.ca is where you'll find great deals and offers. Some you can simply print off yourself and take to the Sponsor, others click through to a web offer while still others allow you to just go to the store and ask for the discount! When you sign in as an AIR MILES Collector at www.airmiles.ca you will be able to customize your Home Page and a great directory to features and functions of the site. You can check your balance, change your address, order new cards, track Sponsors in your area, see the latest offers or browse through the hundreds of rewards. Your account balance is clearly displayed on your home page so that you can see how many reward points you have. You can also use the Dream Meter to track the number of reward miles you still need for the rewards you want the most. The best value for your Air Miles Reward points is the $20.00 Gift Certificate for A&P, Dominion, Ultra Food & Drug, the Barn Markets (Valid in Ontario, excluding Thunder Bay). This gift certificate can be redeemed for 125 Air Miles Reward Points. You can simply request the certificates and they are mailed to your home address within a few business days. They are easy to redeem at any of the stores and you can buy anything with them. They are not supposed to give back any change more than $5.00 but at several stores I went to, they can change no matter what the amount. For example, I spent $122.00 on one trip and gave $140.00 worth of gift certificates and received $18.00 in change. However, in the last few weeks this offer has changed. You now need 140 Air Miles points to get a $20.00 gift certificate. I suppose they realized that it was a very good deal and very popular so they have increased the number of miles needed! 15 free Air Miles for getting a Free health insurance quote from ManuLife. Double or Triple Air Miles when you use available coupons at Sportchek.ca for the purchase of New Balance footware, casual clothing, Nike clothing or hockey skates. These are just some samples of the offers available. These offers have time limits and restrictions but if you are careful and attentive you can find ways to maximize your Air Mile points.